Young Adult Fiction: In the Air by Bea West-Israel | LADY. Jeremy stood on the corner smoking, an umbrella in one hand with bleach stains like rain spattered on it, one hand in a pocket and the other tucked into a coat, the umbrella's stem sticking out as if from nowhere. To anyone passing by, his mood might have been angry, disapproving. He wore a furious scowl as he watched the puddles in the street reflect the theater's neon lights. She came out like a blizzard, a white radiance of snow, dark hair and coal eyes, and he did not even look up. She said goodbye to her fellows, kissing one on the cheek, the next clasping her hand, the third ignoring her and she him. Still, Jeremy did not even give a glance when the swan-like dress reflected in one of his rain puddles. He shifted the cigar in his mouth and the umbrella in his hand. A wind blew and she shivered, smiling, taking that as her cue to get home and change into warmer clothes. Then she passed him, and of all the girls who had gone in and out of that theater, of all the pretty women who had passed that day, his eyes wandered an inch too close to her, not quite reaching her feet, and he shifted because the icy wind had nudged open his coat. But she stopped, glanced back, and raised her eyebrows. "Weren't you out here when I walked in?" Jeremy grunted an affirmation and, if possible, her voice grew harder. "What are you doing?" "For what?" She pivoted on one white heel. It grated on the cement. "Some young girl to come out?" He hoped she didn't hear the smile in his voice behind the muffled words that passed over the cigar. "Well, wouldn't that be you?" "Try it," she snarled back, and he couldn't help but wonder which it was: influence, affluence, or perhaps just blatant, foolhardy courage. But at the least she sounded sure of herself, and he believed her. Jeremy laughed now. "'Leave me, miss. I'm not waiting to abduct someone." "All right, then." Her eyes were narrowed. "Good night." Before she turned, his eyes – until then careful, until then controlled and downcast – slid sideways to see her face: the round, coal-diamond eyes, the dark hair professionally-short. His gaze slid away before he even met hers. She turned and left, clicking down the paved street, and after that entire day he relented and backed up against the wall of the building, taking the cigar in one hand and sliding down onto the water-slicked concrete, resting his head on his knees. "Mind grabbing me an extra cup of coffee, no charge?" He nodded and rasped, "Gotta pay, sorry." "It's a dollar seventy-five, sir." "Mm-hmm. Not much trouble to pay." She sat back and crossed her arms. "I thought that's what everyone did here. Free cup of coffee on the way out." "Mm," Jeremy grunted again and shook his head, the orders he still had to fill beginning to slip away in his head. "Fine, just give me the coffee." Jeremy paused, nodded, and then turned away. He filled customers' orders at the rippling metal bar, set the coffee mug in front of her, retied the apron behind his back, took a second-long nap, and when he went back to check if she had signed the receipt, she was gone, the mug half empty, fifty cents on the counter. Jeremy murmured a word he had never liked, picked up the quarters as if wondering what to make of them, and then slid the mug recklessly across the bar to the busboys before whipping out his rag and wiping down the laminated surface of the table. He sighed another word he enjoyed more, and then straightened up and walked back to take a few more plates and serve a few more tables. It was nearing eight in the morning when a lull came over the place and one could be found taking a nap against the wall. Jeremy untied his apron and hung it up on a hook. Then he put his pen in the coffee mug with the rest of the pens and his notepad on a stack in the drawer. Then, signing out of his shift, he murmured goodbye, opened the door, and stepped into the biting cold outside. Wandering home along the gutters of the sidewalk, he smiled to himself, hands in his pockets, reliving a few moments of the night before. She had passed him thinking he was waiting to follow an innocent girl. And if he had been a man like that he might as well have followed her, all done up in a white dress and heels, walking alone to her car. It was, perhaps, what he found so funny, other than the fact that he, Jeremy, had made himself look suspicious at all. So he walked home, past the apartment complexes with their creaky fire escapes, to his wood-paneled flat with an air of faux elegance and a manageable rent, and pushed the thought from his mind. The flat was flooded with morning sunlight. It actually had a bit of heat wafting from its floorboards, and with a wrinkled nose he slid open the big window across the room, shedding a thick coat and heeling both boots off. Then, traipsing into the kitchen, no longer thinking about the world outside, he receded into his own mind to make a pot of coffee, not yet willing to go to sleep. A padded red coat still hung where he had hooked his own, something forgotten, much akin to the four plates in the sink and the pink-splashed magazine on the kitchen table. He ambled past them, holding the coffee with both hands and leaning out the window, looking down at the rusted fire escape and still farther to the street below. It was peaceful, watching the city go about its business, the people walking on both sides of the road through the dense cold. And among them he saw black hair, a white coat, wondered privately what her fixation was with white, and turned away from the window in a rare move. His eyes fell again upon the magazine, crinkled and dull, and he chuckled to himself. He picked it up, rolled it, and stuck it in the garbage disposal. She walked in the door the moment he sat down on the couch. He slouched against the faded red pillows, and a red cloth purse slouched on the tabletop as well. "Honestly," she muttered, seeing all the plates. "You can't do a single dish?" "I do dishes all day," he muttered. "Why're you back?" "It's on the coat rack." "I know that." Her voice was terse as it usually was when they saw each other unexpectedly, even if it was the fact that he was awake and she didn't expect it. He heard a sudden silence from the kitchen, another sigh. "Oh, gross, Jeremy. Why is my magazine in the sink?" "Sorry. It was looking old." She snorted curse word, and for a moment he thought about telling her that a strange swan-lady in a white dress had thought him a predator the night before, and wasn't that hilarious that he had made himself look like a predator, and he had actually seen her again just out the window, and wasn't that strange, and how did your day go, Emma? But he did nothing. If he put his funny little experience in the air between him, it would be charged with tension and venom in a heartbeat. She wouldn't be able to resist giving some snappish remark about how he did look like a predator when he was fat and he didn't shave, and then he would say something about her looks and instantly it would break her heart, and then he wouldn't sleep all day. So he sighed and sipped his diluted coffee, burning his fingertips where the ceramic had become too hot, and she pulled her red coat off the rack and shrugged into it, muttering, "Have a good morning." The door thudded closed and he had an overwhelming desire to go to sleep. He crossed the linoleum tile to the sink and turned on the hot water, soaking the plates and the coffee cup, and then his energy was spent. He padded down the short hall to the single bedroom, turning off lights as he went, and rolled gratefully into the rumpled bed. He woke only once that evening when she clicked into the flat in heels and began changing in his sight. She climbed into bed all loose red hair and tank top straps. He hesitated, wishing he could reach over for something, even just to flick at her hair and then go to sleep, but a glance at the clock told him it was nearly time to get up. So he waited until Emma had fallen asleep and then swung his feet onto the floor, kicking her blouse out of the way, knowing that she had worked late and then hanging it up for her with a sigh. The clock's red numbers glared at him as he changed into something dark, halfheartedly combing his hair with his fingers, knowing that no one expected the night shift to look prim and polished. He pulled on his old boots, cast a single gaze back at the young woman, and then plodded down the stairs with his coat on his shoulder, locking their flat door behind him and nearly falling down the metal stairs. 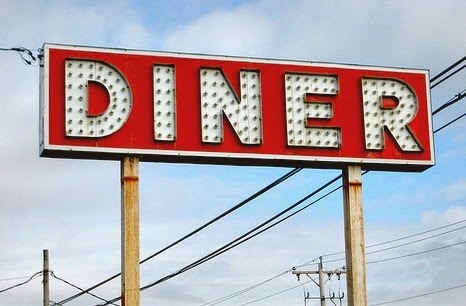 Down the block he went, to the neon diner with its checked patterns and red vinyl, a place that tried to look traditional and nostalgic, but only succeeded in looking old. It was the only thing making him feel young after he caught his own reflection in multiple department store windows, the movie theater's bright light making him appear gaunt and even more unshaven than usual. Hands in his pockets, fingers circled around the plastic-wrapped cigar, he gazed curiously at the window, glanced ahead just in time to sidestep a broad metal pole, and continued with a sigh down the street to the diner. The walk was not a dangerous one, nor long, but nevertheless he let out a breath when he stepped into the restaurant's blinding light, and immediately he was hailed from across the room. "Jeremy, good to see your face!" he called, his voice boisterous, unconcerned with who else heard. Jeremy, more subtle, less comfortable with attention, nodded once and disappeared into the back where his greeter waited, already untying his black apron. "Take this, will you? I know it's early," the other man pleaded earnestly, tossing him the garment. "I've got a date." "Ah, right." He flicked the pen out of the pocket of his jeans and stuck it in the jar of coffee beans where the others stayed. Jeremy began to tie the apron behind his back, his head ducking a little as he did, keeping his eyes on the other. "Who's the date?" he inquired quietly. "Ah, girl from school, you wouldn't know her. She says she knows Emma, though." The young man paused. "How're you guys, by the way?" "I thought you had a date." "I do, but I've got a bit of time." His voice had eased up and he was still smiling, ruffling his hair in the mirror and palming it back down. Jeremy, taking a pen and opening the drawer for a pad of paper, shrugged. "She still mad at you?" Jeremy grunted in response, and the young man grinned, unperturbed. "You mad at her?" "I don't know, Carlos, you have a date." "Okay, okay." Putting his hands up, the other stuck his hand out as he passed, and with a small smile Jeremy shook it, his eyes amused under his low brows. Carlos waved and called a loud goodbye to all of the others on his shift before he disappeared out the door. Jeremy watched him go, and then let out a low breath and walked out to show a young couple to a booth by a darkened window. He brought them a few waters and promised that their server would be there shortly. Then he bussed the tables, pocketed only the change that he had earned, and got on with the night. The traffic slowed down after midnight, and again Jeremy caught himself falling asleep against the wall. He got a water for himself and watched another waiter walk up to the group that had arrived, none of them speaking much English, perhaps travelers jet-lagged and looking for a meal. With a nod and a winning smile the younger waiter showed them to a table, took drink and food orders, and shortly after Jeremy was cooking, mixing iced tea and lemonade, filling fountain drinks, trying not to make eye contact, and then bussing tables again, grateful when he was offered a share of the tip money for his work. Nearing dawn, there were less than three people in the diner, and the servers were attending sleepily to them. Thanks to Carlos, Jeremy was again slouching on a stool, his head drifting downward before jerking awake, wishing the time had passed faster. It was that moment when the door jangled open and Jeremy looked up, blinking, focusing, and then standing quickly from his seat on the stool. "I'll take it," he said in a low voice, and his lethargic companions didn't object, letting him grab a menu and weave around chairs and tables to the podium. Her eyebrows lifted, and she folded her arms across her chest, still looking done-up with her hair styled and clean, wearing what seemed to be a businesswoman's outfit in panels of beige and the ever-present white. He fought to look as though he didn't recognize her, garbling the standard, "Hello, my name is Jeremy and I'll be your server tonight." "Jeremy, is it?" she asked, following him to a table. "And you work here?" "Well, I suppose we're acquainted by now. I never saw you on that street corner again." "Scare me?" She chuckled. "You would've been the one in danger." He flicked his eyes to meet hers and nodded without objection, and for a few moments she was silent, apparently surprised, as he placed the menu in front of her. "So what will you be having, then?" he inquired carefully, pad and paper at the ready. "Water it is." He disappeared back around the corner, filled up a plastic Coke glass of ice water, and brought it back out to her. "Do you need more time to look at the menu?" "Well, what do you like?" she asked without looking at him, regarding the laminated paper before her with passive interest. "Do you have any allergies?" he asked in return, lowering the pad of paper. "Nothing but shellfish," she returned, her voice aloof. He fought a smile nevertheless, and nodded seriously. "Then I'd suggest the bistro special. Good and light for this time of night." "Ah." She scanned the menu, found it on the paper, and folded up the menu. "I'll do that and a cobbler, then." "I'll bring them right out." He nodded, turning away and dropping the menu back on its pile, and put in the orders. He let his gaze drift to her only once before slouching on the stool again, out of her sight, wondering if he should help with the bistro special. She waited and waited, eventually pulling out a phone and scrolling through it, and finally her orders were up and Jeremy was dead asleep. Instead of shaking him awake, another man brought them out. Eventually he woke and hurried to her table. "Uh, how are you doing?" he inquired groggily. She lifted an impetuous gaze to him, a small smile on her face. "I'm fine. Are you tired?" "Night shift...working," he muttered, rubbing his eyes. "Is everything tasting all right?" "It tastes interesting." He only nodded, not quite noticing her dissatisfaction, but she raised another forkful of cobbler to her mouth. "Do you work here every night?" "Then you go to the theater and hunt down girls, do you?" He smiled a little, opening his eyes wider to look at her. "No." "Ah." She leaned back, scrutinizing him. "Then why were you hanging out on that street, Jeremy?" "I was thinking. I don't sleep at night." "Sometimes." He watched her take a last bite of cobbler and push it away, leaning back against her seat. "I'm finished. The check, if you please." Wordlessly, Jeremy dipped his head and shuffled off to fetch the leather-bound booklet. As she withdrew her credit card she asked lightly, "Hey, don't you all do free coffee? Discount coffee on the way out?" "For one thing," he sighed back, exasperated, "that was our old boss, and he was nearly arrested for it. And he did it past six o'clock only." She raised her eyebrows, putting both hands up. "Well, then." "Should be. Snapping at people at three o'clock in the morning just for asking a question." "Taking five dollars off your tip for that." She shook her head, and he could not tell if she was smiling, and if she was smiling perhaps she was amused, and if she was amused perhaps he had done something right. Either way, his questions were answered when she handed him the checkbook. He went back to swipe the card and came back to her table to find a ten-dollar bill beneath the salt and pepper shakers that hadn't been there before. She smiled, standing before he could say anything, and shook his hand goodnight. "Well," she said, "I think I need a good night's sleep. Have a good shift, Jeremy." Dipping her head, the woman disappeared out the door and he pocketed the bill before anyone could ask questions, feeling confused. By the time his shift ended, Jeremy had taken it out to look at it multiple times, wondering if she had cheated him, wondering how anyone could possibly leave ten dollars on the table of a night shift waiter. He had heard of random acts of kindness before, but they were always the tooth fairies of the working world. He untied the apron, pocketing the bill again, and took the envelope full of his tips and dropped the pen into the jar of coffee beans. He turned the corner out of the kitchen and paced to the front of the diner where the morning light was streaming through the door. He walked down the block and a ways further to his own flat, the lowest rent on the street, past the tiny gray park and the sidewalk bridge that ran over the sewage pipe, below which bubbled a tiny gray river. Jeremy walked, crossed the street, and stomped up the complex's stairs. He had reached the top when he realized his mind had been too full of one person to even remember his coat, but he was too tired to make the effort to go back and retrieve it. And, after all, the only thing in his coat pockets was his cigar. So he unlocked the door, stomped inside, and pulled the boots off his sore feet. She was in the kitchen, making herself breakfast, and she barely offered him a greeting when he walked in. He collapsed on the couch and did not make conversation – he had certainly tried that before – and when he woke, she was gone and it was dark. The night was early yet, but he had nearly slept all day. So he walked up and down the street until, finally, he sat and dozed in the diner where he worked, letting the time pass until his shift. Jeremy asked how Carlos' date had gone, got a mumble for a reply, and gave the young man a heartening clap on the shoulder, returning a similar mumble when he was asked about Emma. He shook his head. "I've got no advice for you, either," Jeremy sighed. "Just stay careful. Make money." "Make money? That's your answer?" "Sure keeps you happier." Jeremy shrugged, his tongue tying in knots. "Not…saying that love needs money. You understand." "You're tired, Jeremy." Carlos smiled a little. He grabbed Jeremy’s hand and thumped him around the shoulders. "Sure you're sleeping enough?" He began to take off his apron as Jeremy signed in, and the older man smiled and nodded. "Well, it'll get better for both of us, eh?" Smiling a little wider, and nodding, Jeremy saw Carlos off and waved when he turned around. Then the diner door jangled shut. And the man lifted a pen and pad from the jar and drawer and got to work. Again, the traffic slowed at three in the morning, and again he took short naps against the wall. It was not that he needed the sleep, or that he was tired; he had been deprived of sleep often enough to know when he needed to sit down or hibernate for a day. But it was what waited for him in the little apartment flat, with all the glaring red – the red purse and red jacket and red hair and the red temper everywhere – and it was enough to make a man go insane if he wasn't careful. He had moved in with Emma thinking that he had mastered handling her temper, that he was a steady, peaceful person…and then he found that his peace only went so deep, that she was human just like the rest of them and expected what the rest of them did. And Jeremy, short and with a tendency towards gaining weight, working a night shift for less than ten dollars an hour, was not enough. Not even his peace had held out beneath the pressure of a future, and eventually he cracked and began to snap at her. In return she stopped waking him up for his shift, didn't always make two plates of breakfast, and their home turned the both of them into simmering pots of contempt and impatience, things that neither of them had been before. So he served two more tables, gave a free cup of coffee to the third with a reluctant sigh, and, at exactly six o'clock, she walked in just as he was finishing his shift. He froze in quiet surprise, watching the white feathered hat slip through the door, the white dress again, and without thinking he walked over to her in his black apron and smiled. "Hello, I'm Jeremy and I'll be your server tonight." "Ah." She smiled as well. "I was just hoping I'd find you here." She chuckled. "Yes, that. And after I figured out you weren't a predator. I was curious, you know. You understand how people are. Something catches their eyes beyond their personal little bubbles and they've got to know all about it." "And you're what, a journalist?" "No, no, I work somewhere else. Just curious." "Well, I'm not sure I should say anything to you." He was vaguely aware that his voice was rich with inflection, smiling, joking. At this, she chuckled again. "Nothing to fear but fear itself. Have a cup of coffee with me?" So he untied his apron, conscious of the stained button-down beneath it, and signed out of his shift before bringing them two cups of coffee and sliding gratefully into the bench seat covered in sticky red vinyl. He drank a good long gulp to stay awake, and then put the white mug on the tabletop and his elbows on the table, focusing his eyes on her. She was smiling vaguely, waiting for him to stop moving. "If you need to get home, though, I understand if you want to sleep." "Sleep would be wonderful," he agreed, "But I'm doing fine." "Well, as long as you don't mind." She smiled. "Neither do I." Jeremy nodded, smiling back. He leaned on his folded arms and said slowly, "I…I never got your name. At least, I don't think I did." "It's Angela." She put out a hand. "Nice to meet you." "Angela." He shook, smiling again. "Nice to meet you, too. What brings you here?" "Oh, I guess I was just interested, like I said." She shrugged a little, writing it off as nothing. "I've passed you three times now and I couldn't help but wonder. Mostly because you were standing in front of the theater like a creepy old man that night." He laughed a little, almost startling himself when the sound came out. She watched him with raised eyebrows, waiting, as he leaned back and took another drink of coffee. "I was...thinking," he answered finally. "The curb in front of the theater seemed as good a place as any to stand and think. All the young couples going in and out, and the friends, sometimes older couples, and you and whoever you were with." He decided to nod. "Mostly." "You have a girlfriend?" She paused. "Or, you know, boyfriend. Or a wife." Jeremy felt himself smile and shake his head, and then his shoulders dropped as his mind went to the little apartment. Angela waited, watching. "I…yes, I do. Things are...rough at the moment." Her brows creased in sympathy and she took another sip of lukewarm coffee, asking over the mug, "What's she like?" "A hurricane." He smiled dryly, glad when she laughed. "Red hair. Witty as anything. Hates it when I'm sarcastic." "Oh?" Angela brought one foot up on the bench seat, curling her knee on the red vinyl. "Hates it when I smoke." "Oh?" She was beginning to smile, so he continued. "Hates it when I drive, too." "So is it safe to assume she hates everything?" Jeremy found himself smiling as well, shaking his head. "Just me lately." "Did you do anything to deserve all this?" "Maybe." He shrugged. "I just...stopped caring as much. She's got a better job and a better career than I do, so she feels like she’s carrying the load in the relationship." He found himself stating her words exactly – "the load in the relationship” – and he shrugged uncomfortably, feeling the need to prove himself to this stranger even if he couldn't prove it to his girlfriend. "I'm trying, you know, I really am. But I dropped out of college. I tried to take on too much. I really wanted to take a break, but I applied to the best schools I could. I worked hard enough to be accepted. I made it maybe two years, and then I just couldn't make myself go back. So I took a gap year…you know what those are? Those little breaks between school?" Angela nodded, interlacing her fingers on top of the table. Jeremy shrugged. "Sounds like you need a break." "Not when she expects jewelry and chocolate every holiday. Or a family. Or a marriage. I couldn't even pay for a ring." "Do you want to marry her?" The word came out before he was sure of it, and he regretted it. It held a grain of truth, but it didn't merit his harsh certainty. Angela raised her eyebrows and sat back. "Well," she said lightly, "there's your problem, then. I'm no expert, but it sounds like one of you is doing something wrong." "I'm trying. I just don't have...the tools for it." "You could finish your degree." "I already have student loans." "You could make up for it in character." Jeremy gave a hopeless laugh. "I don't have that kind of character. Apparently." "Well," Angela sighed with a sympathetic crease of her mouth, "talk to this girl, then. I'll bet she'll tell you what she needs, and if you can't meet that, your relationship's no good. For now." "Mm-hmm," he sighed, glancing into his souring cup of coffee. Quietly, a ten-dollar bill was slipped onto the table between them. "Come on, then," Angela said with a small smile, pushing her white mug aside. "How about a good movie? Get you off the street corner and into the theater itself, hmm?" Jeremy lifted his gaze from the coffee to her face, to her coffee-dark eyes, and could not keep from smiling. 1 comment on "Young Adult Fiction: In the Air by Bea West-Israel"
The description of the diner was particularly noteworthy.